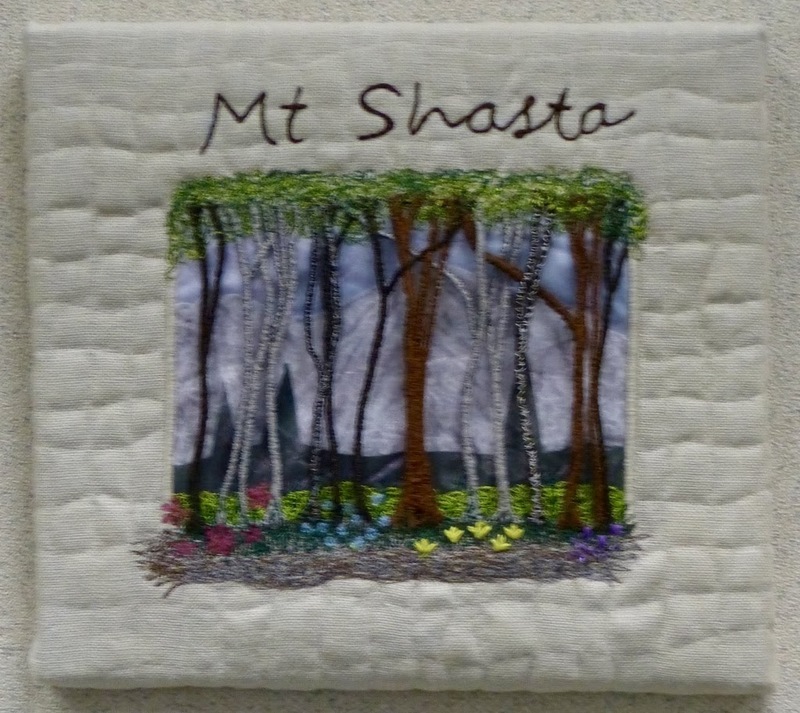 Mountain Art Quilters: Hot, hot, hot quilts for the month of July! 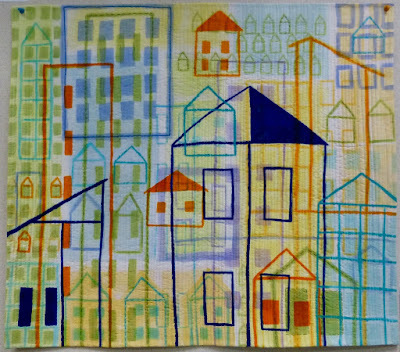 Our July reveal included three challenges: "To Dye For," featuring fabrics hand-dyed by the artist, "I've Never Done This Before, Part 2," and "Imagine," a challenge to the imagination. We also welcomed a new member and were treated to a quick Show and Tell. Hot, hot, hot quilts for the month of July! Our July reveal included three challenges: "To Dye For," featuring fabrics hand-dyed by the artist, "I've Never Done This Before, Part 2," and "Imagine," a challenge to the imagination. We also welcomed a new member and were treated to a quick Show and Tell. 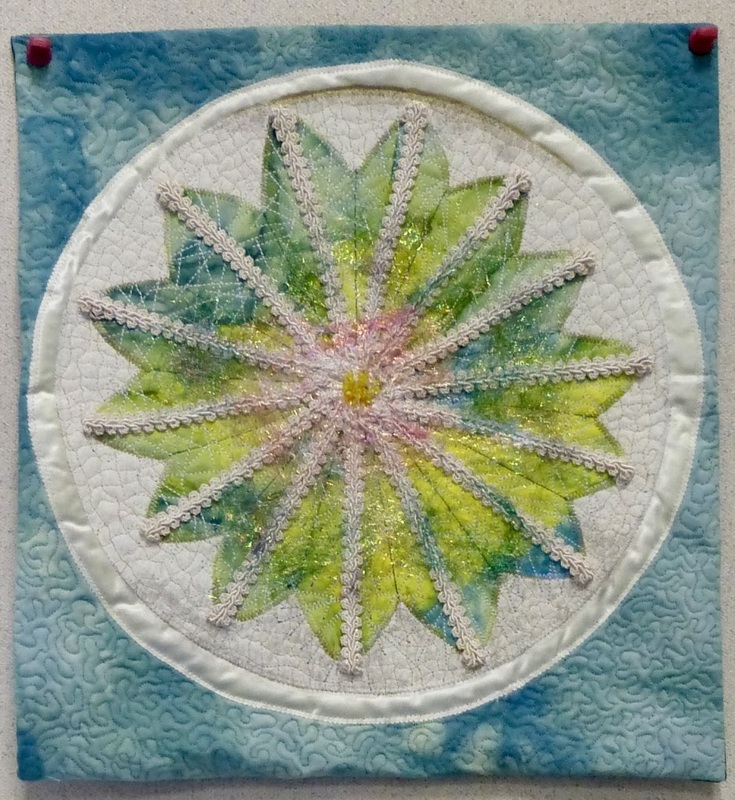 Bonnie's quilt was inspired by a photograph of a cactus plant that she saw in a magazine. Bonnie dyed the fabrics for both background and cactus, added a satin circle, beads, crystals, and cotton trim with a layer of Angelina for added sparkle and copic marker for shading. Bonnie says that while she admires the creative quilts of others, she prefers her own to be neat and tidy. 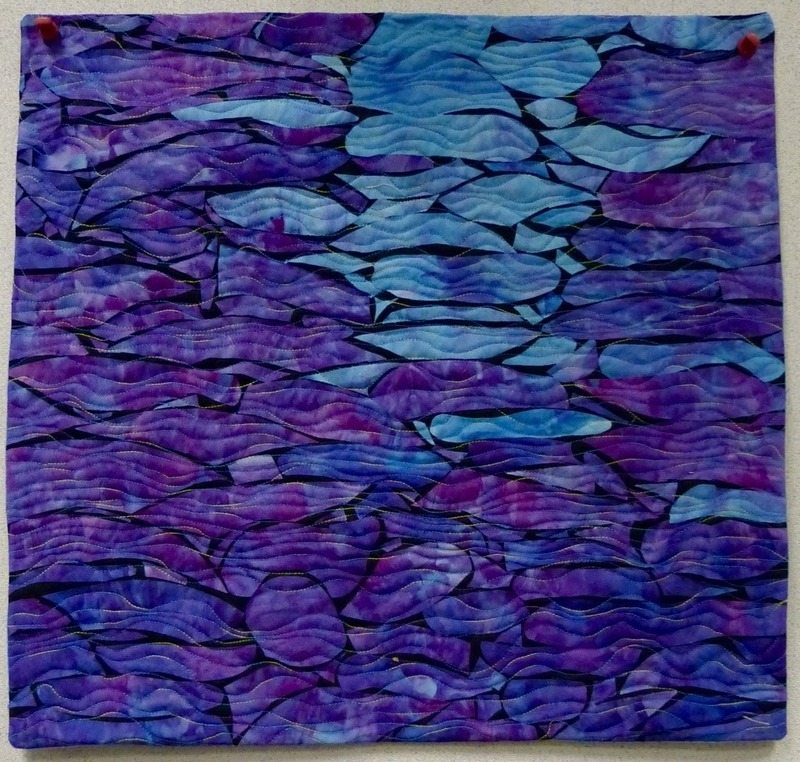 Jan's experiment with Pebeo Setacolor sun dye paints, leaves, and metal fish resulted in this watery quilt. 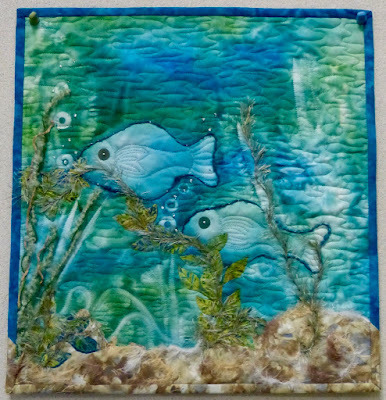 Jan used yarn embellishments to complete her underwater scene. Trish used ice-dyed fabrics, black background fabric, and tulle to create this image of light as it reflects off water at the end of the day. 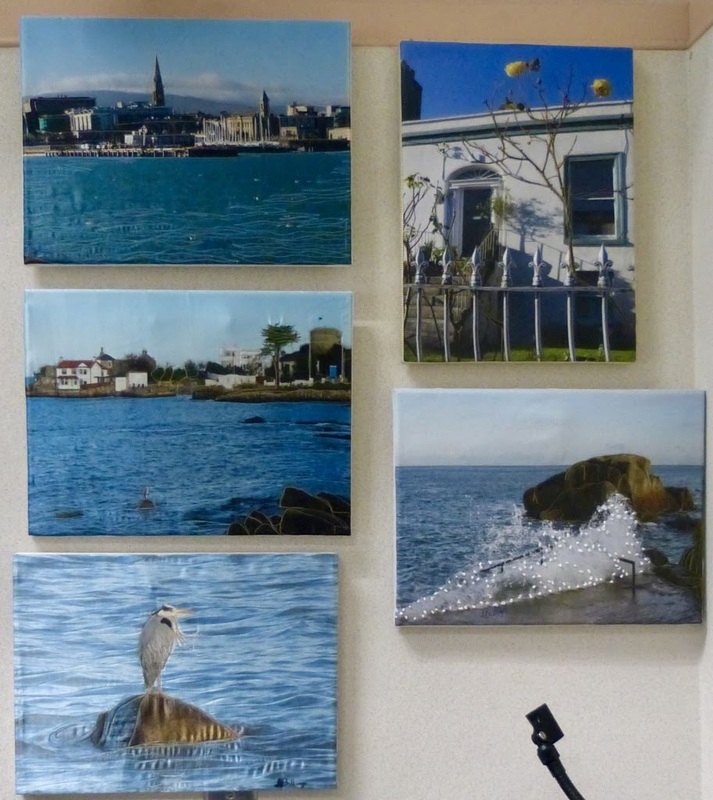 Trish says it was all about the balance, and that recreating the gentle ripple on the water in the late evening and the reflection of light was a challenge for her. 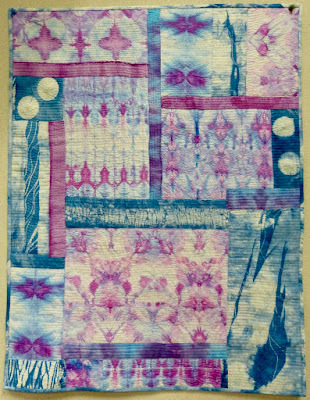 Ginny use Procion MX dye paste, radiance silk/cotton blend fabric, and silk to create this intricate piece. Inspired by Kerr Grabowski's deconstructed printing, Ginny applied black paste to a screen and allowed it to dry. As she printed repeatedly with overlays of colored dye paste, the resist areas gradually changed from white to black. 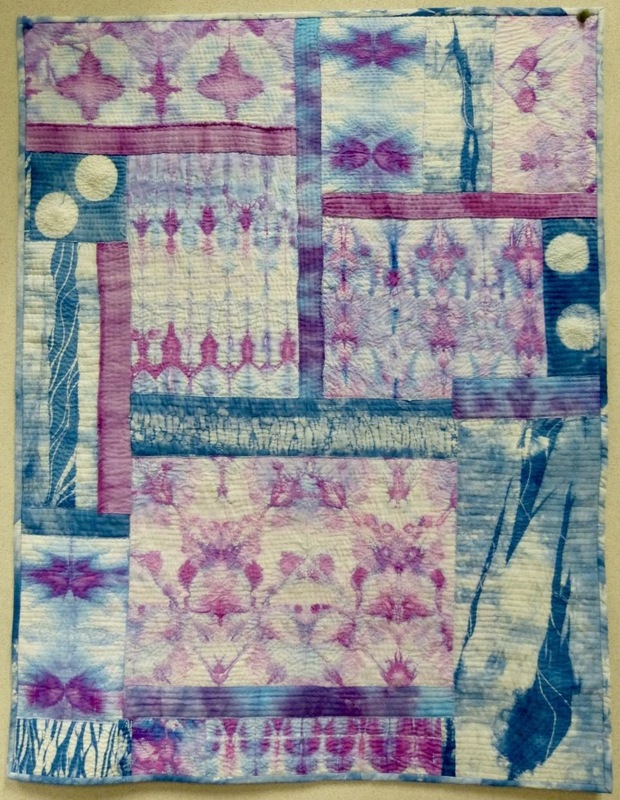 Pat had a collection of indigo dyed fabrics, ice dyed fabrics, and various hand-dyed stripes from her forays into dyeing, so she decided she would find a way to make them all go together. Inspired by Kantha cloth, Pat hand-quilted the top using running stitches over the entire quilt, a process known as slow stitching. The backing was added last and the blocks were machine stitched. Patricia was inspired by a picture of a butterfly made out of paper to do something similar with her hand-dyed fabrics. 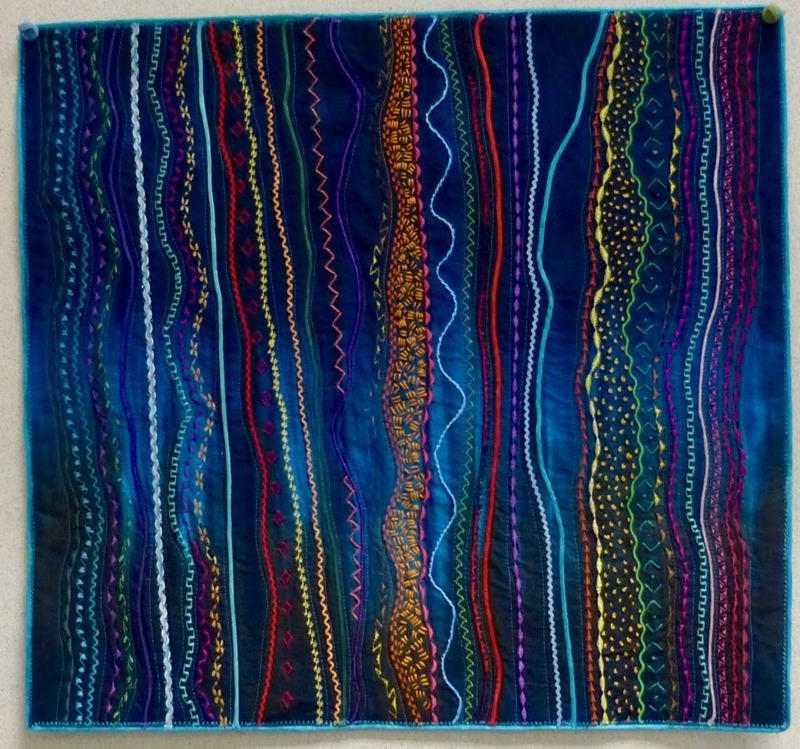 In creating the quilt, she drew the pattern on Steam-a-Seam, a technique she learned in a class and says she would not use again -- it required copying the pattern at least three times! Maria wanted to learn how to stitch, couch and finish her quilts with rattail bindings, using techniques developed by Carol Ann Waugh, so she challenged herself to create this quilt. She found the couching technique quite easy, but the joining the ends of the binding was tricky and she ended up watching the video on Carol's website many times. Maria did 22 rows of machine stitching, 6 rows of hand work, 7 rows of couching and 3 rows of added trim and rick rack. She wanted to leave large open spaces so that the beautiful Glacier Peak ombre fabric would show through. Karla tells us that she was inspired by the "Me, too" conversation to share some of her own memories. 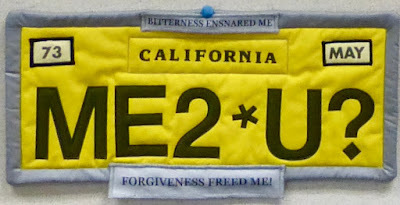 While she has not forgotten, she has found a way to forgiveness, freeing herself from bitterness, anger, and a desire for retribution. Karla expressed her journey in this personalized 'license plate' -- her first whole cloth quilt. She incorporated a tulle overlay, vinyl letters from the scrapbooking section of the craft store (which don't fray like fabric ones do), and teflon cloth. She used Elmer's washable school glue for basting. 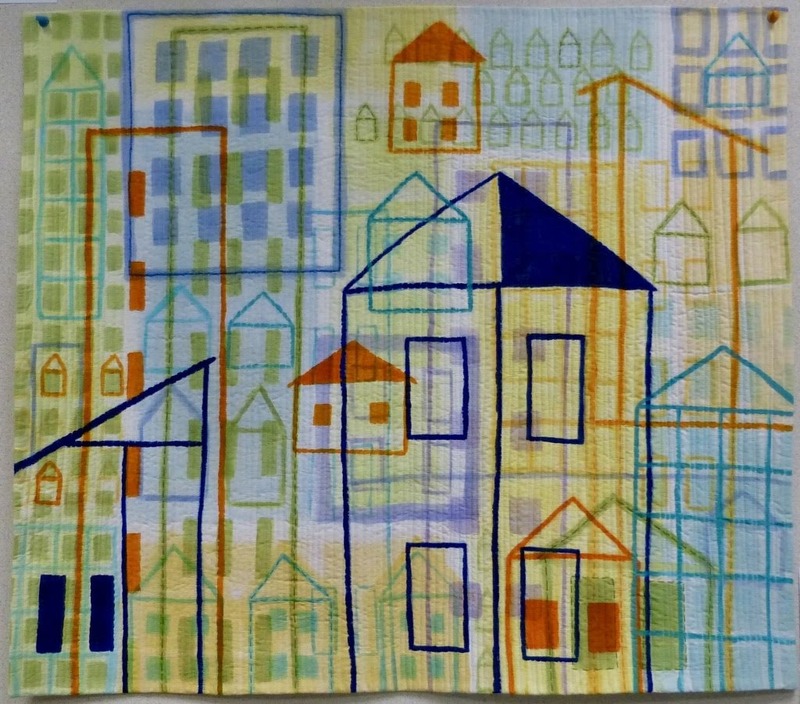 Lynn continued the theme of quilts with serious messages in this stark abstract. 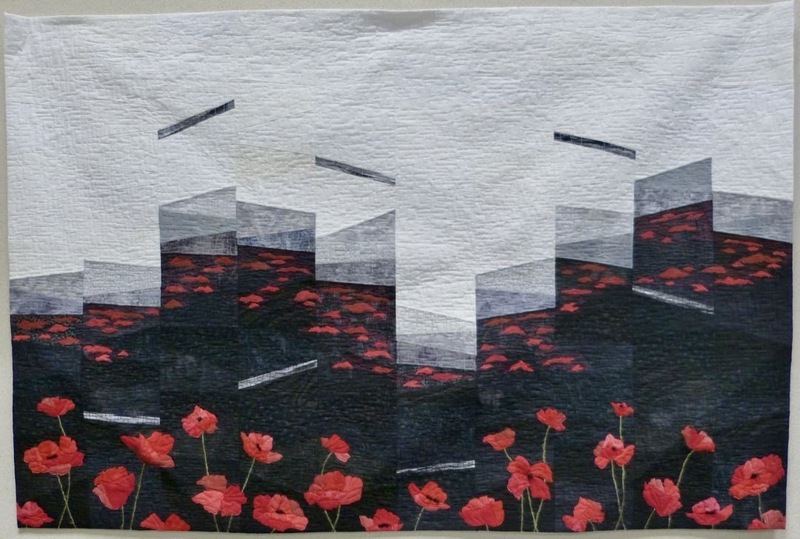 She was inspired to create her first political quilt by the grief she feels for the extremism that engulfs us. It seems that all is black and white with sharp, angry angles, and not enough of the gray of compromise and thought. The red poppies, the color of hate, war and blood, are in memory of the millions who have been sacrificed to extremist thoughts and actions -- the fascism of World War II, the people of color in the 1960's who dared to walk across a bridge, and the young people protesting a war. Now students are being murdered because politicians can't get past extremism to rein in assault weapons. Lynn used hand-dyed and commercial cottons, including 10 different whites, as well as yarns to create this image. Sophia's inspiration was her first date and a moonrise photo. 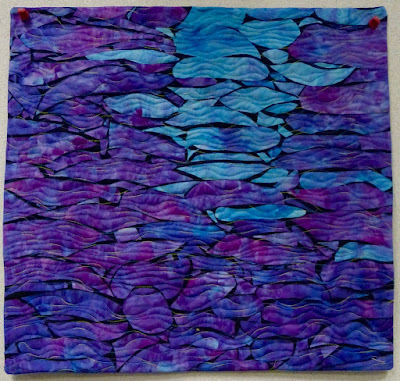 The moonrise fabric was dyed to match the photograph and given texture using a technique of ruffling tulle. According to Sophia, getting the perspective and size correct were her biggest challenges, but she took a leap and created the foreground without a reference photo, a first for her -- as were the background technique and the confetti flowers. 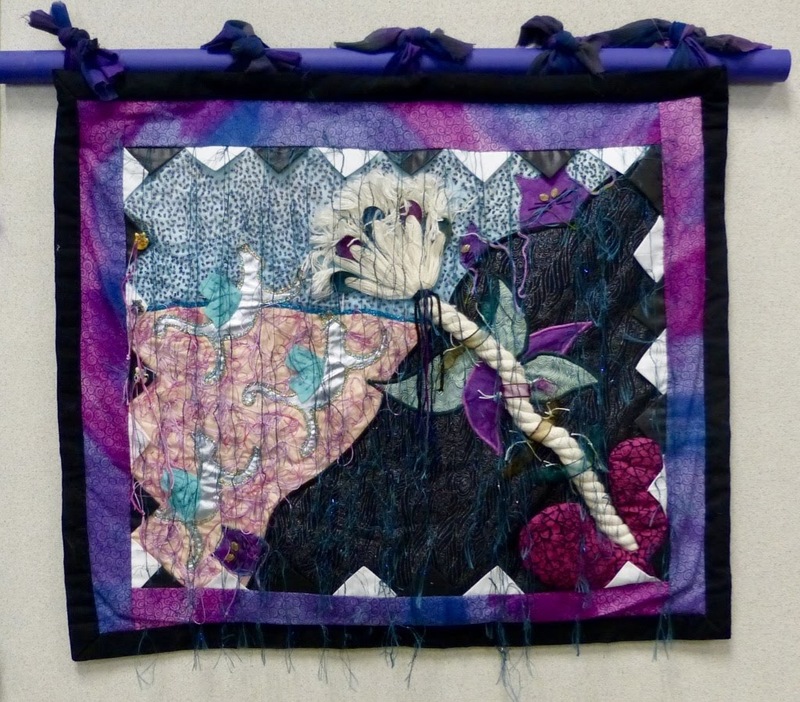 She used commercial and hand-dyed fabrics along with a little Angelina. During the winter of 2016-2017, a black chinned hummingbird sat in the bare branches of a hibiscus bush just outside Julie's window. For whatever reason, this little bird didn't migrate south but stayed in the bush, sheltered by the overhang and the walls. In his honor, Julie created this quilt, experimenting with new techniques -- using a flour resist, painting with ink, stenciling, incorporating a poem, and finishing with a curved facing. 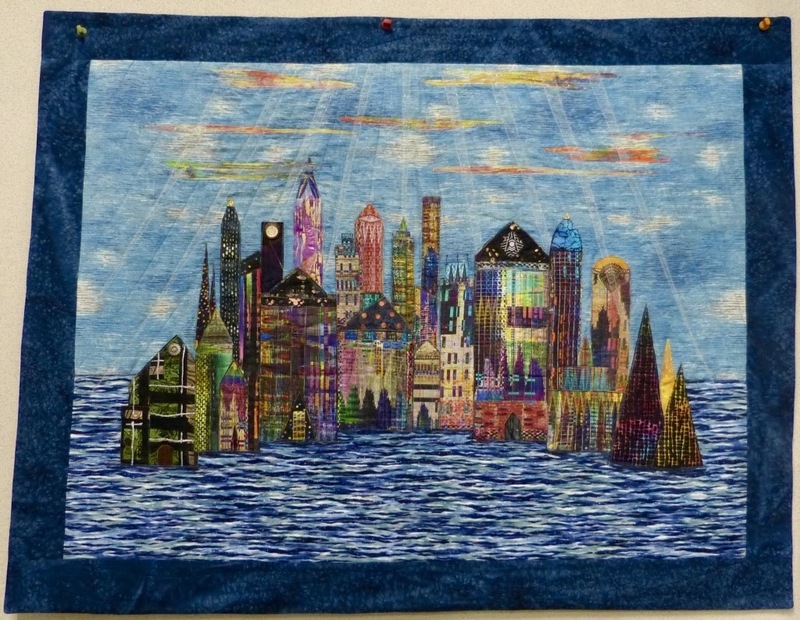 She used denim, cotton, monopoly polyester thread, Procion MX dye, Tsukinenko ink, glitter paint, and Seta color paint. She included ice dyed fabrics she made a couple of years ago. 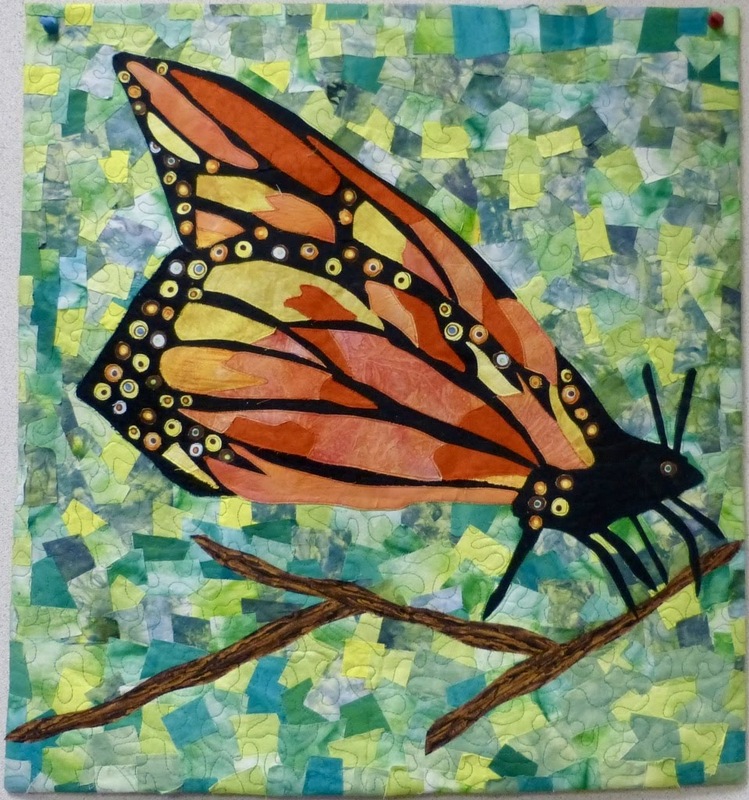 Darlynn wanted to do something she had never done before, so she made stamps and stencils to create a quilt that gives a perception of depth. She first discharged some leaves with Soft Scrub then used Shiva paint sticks, translucent and opaque paints to create the effect she wanted. This quilt features hand dyed fabrics, self-made stencils and stamps, paints, Tsukinenko ink, wool batting and various colors of thread. 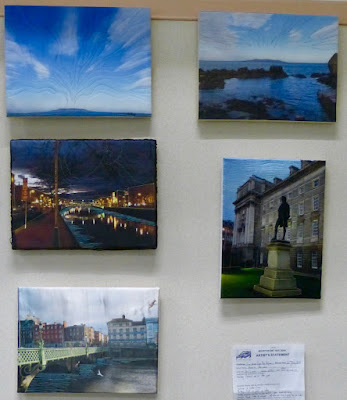 Maria's trip to Ireland earlier this year resulted in this lovely series of small quilts. She had her photographs printed on sateen or a cotton linen blend at Spoonflower, then stitched and embellished the quilts in unrealistic colors to create a fairy tale aspect before enforcing the edges with stabilizer and stapling them to wood stretcher frames. 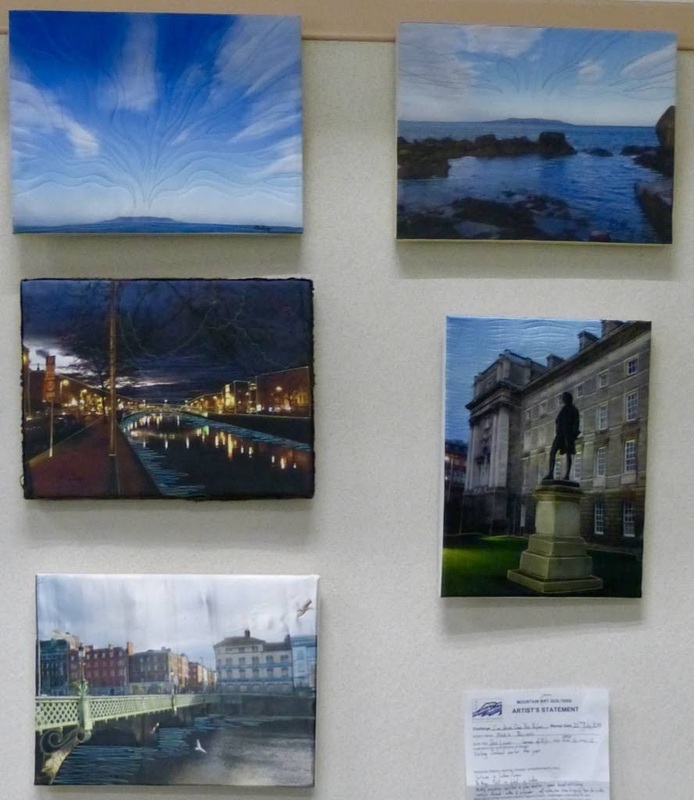 She used self-adhesive linen hanging tape to finish the sides of the frames and German-style wire to hang them. Pat has been spent almost 50 years watching this mountain change and soaking in the calm atmosphere it brings. 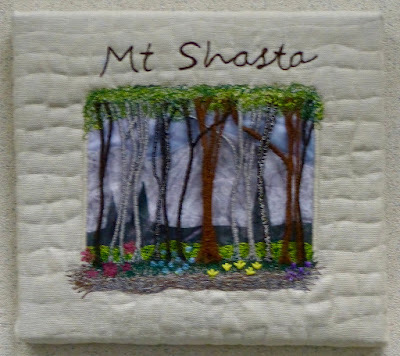 She began this piece with drawn work on linen, stitching the trees. Then she added the mountain background with fused appliqué, drawing the gray on on the mountain. She added a sheer overlay, embroidery at the bottom of the trees, and joined the layers with more embroidery. This quilt was inspired by a line from a John Lennon song, "Imagine all the people living life in peace." 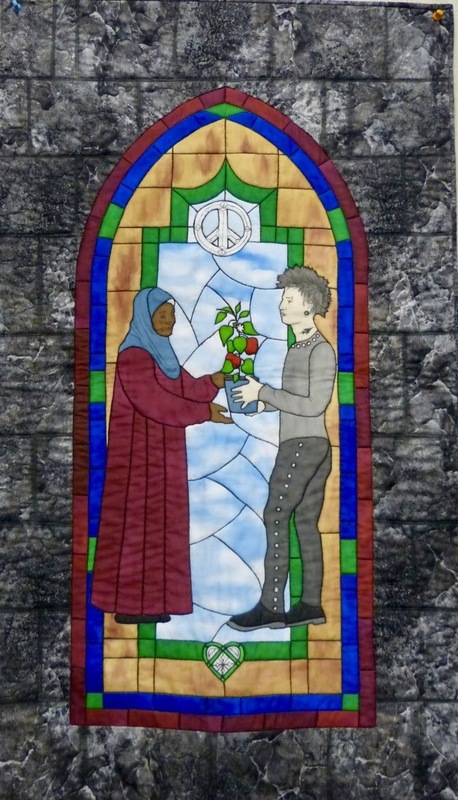 At her sister's suggestion, Linda started with an image of one person giving another person a plant, making the two people as different as possible -- an old, black, Muslim woman and a young, white, male punk rocker. She used Pebeo water soluble gutta and DynaFlow to paint the 'window' on 8mm silk habotai. The border is a commercial fabric toned down and enhanced with a wash of paint. According to Sigrid, this is an improvisational design with simple child-like drawings of homes. She and her husband ran a homeless program, Family Promise, at their church for several years. The children were the hardest for her to deal with emotionally, and at times, they were more like parents than the adults were. 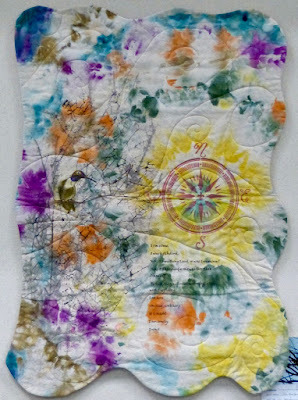 This was created as a whole cloth, cotton quilt with thickened dyes, paint, and a wool batting. The paint was applied after the quilting. 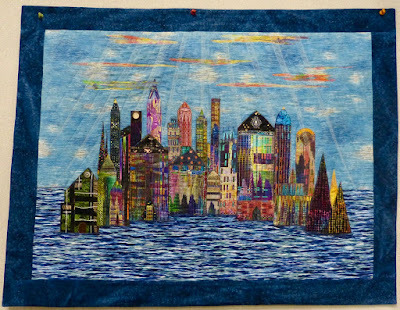 This quilt depicts a city in Mary's imagination seen, perhaps, by an immigrant seeking refuge in America. An immigrant herself, Mary is aware of the unrealistic expectations people often have, thinking of the USA as a mythical Promised Land. This dream-like city, floating on water, with its limited number of doors, is her interpretation of those expectations. 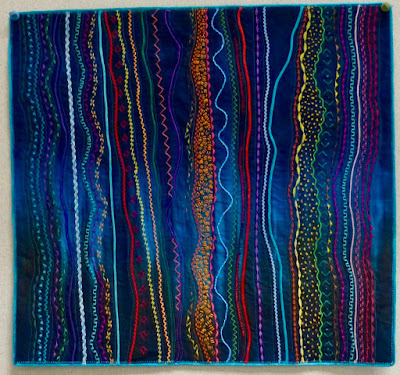 Mary created this quilt with cotton fabrics, paint, pencil, a bamboo batting, and multi-colored thread, some of them metallic. Her main technique, brodie perce, is also known as Persian embroidery. 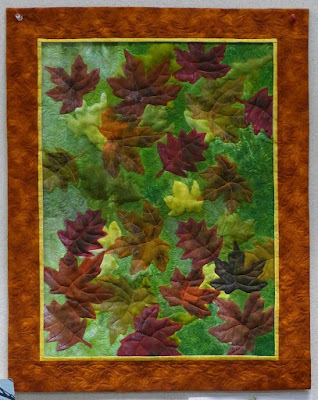 This month, we welcomed another new member, Sandi Lauher, to Mountain Art Quilters. 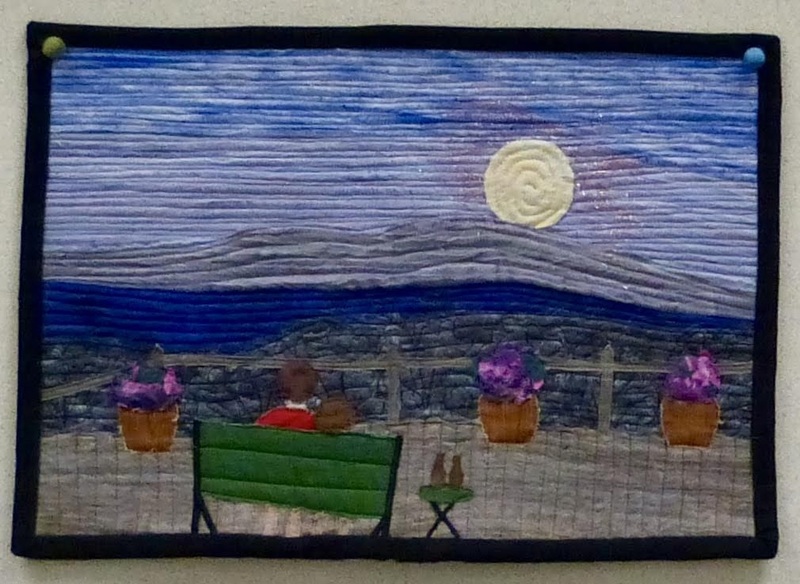 Sandi brought a couple of her quilts to share, including this piece. The koi fish were done with felted wool with a silk hankie adding a watery feel. 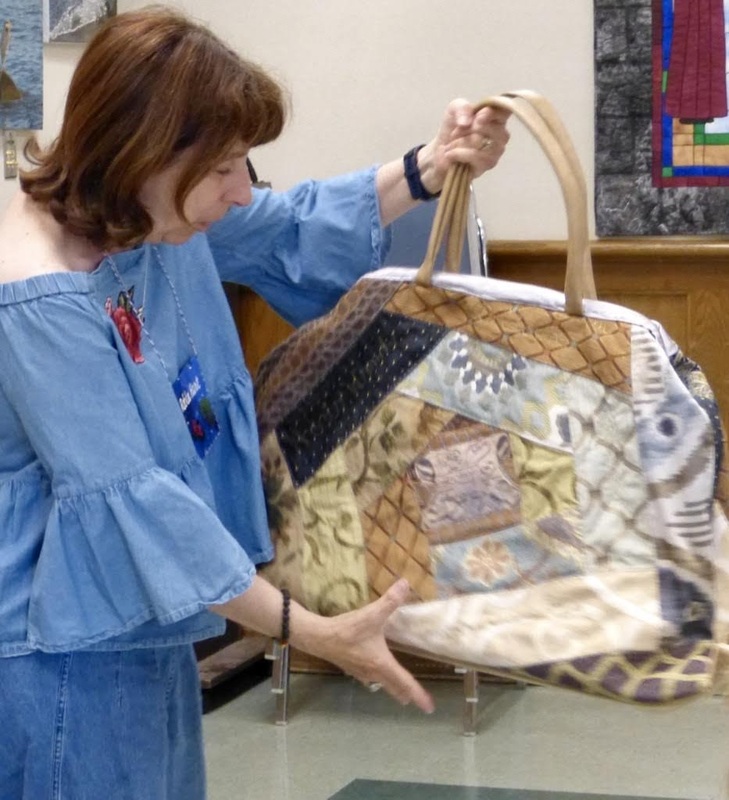 Sandi loves koi and their peaceful, poetic movement, but she felt that the piece needed something more, so she added a top piece of interwoven fabric curves. This second piece by Sandi was inspired by a dream of hers about cats and their nine lives. 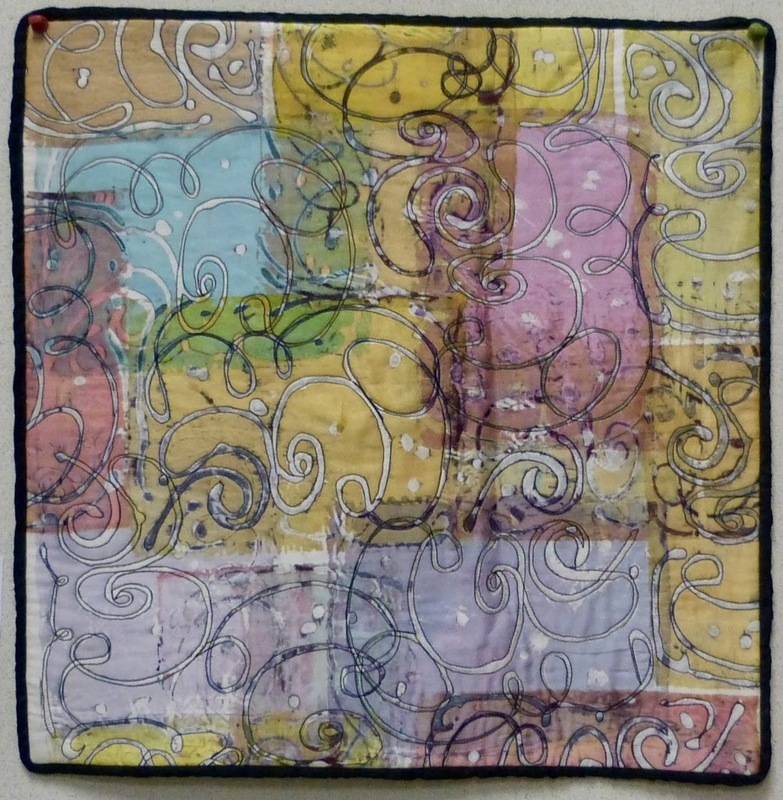 If you look closely, you will find nine cats in this creative, multi-media quilt. Robin Hart brought her Harry Potter inspired carpet bag to share with the group. In addition to themed fabrics, Robin incorporated various spells from the book, including "Wingardium Leviosa."